Rejoice in Me this day, says the LORD. REJOICE! This is a new day, and I have given you renewed strength. I have given you multiple blessings that cannot be numbered. Rejoice in My goodness. 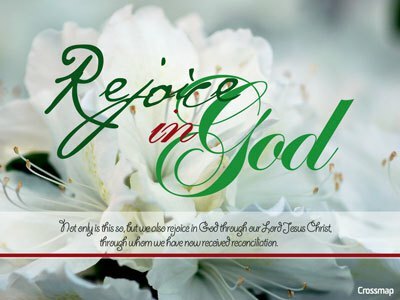 Rejoice and celebrate Me and the life that I have given you. The very breath of My Spirit is in you, My favor rests upon you. I have placed My name upon you and have fully equipped you to conquer the land that is before you. There is nothing missing in the armor that I have clad you with, and you have the sword of MY SPIRIT. No enemy will be able to stand before you. Rejoice, for the fight is already called and you are the victor, says the LORD. Be glad in Me, for I Am for you and not against you. I Am always with you and on YOUR side. Nothing can harm you and I have sent My warring angels to surround you. You are safe and secure in Me. The weapons of the enemy are broken and his fiery darts quenched by the shield of My faith. Trust that this is a good day that I have created for you, a day of strength and vitality in Me. Rejoice, for no power can conquer Me, and I Am with you always to protect you, defend you and provision you as you trust in ME with all of your heart and depend upon Me and My continual presence in your life, says the LORD.